The mullion detail on the Amish Fancy Mission Curio Cabinet showcases the beauty of the solid wood you select. 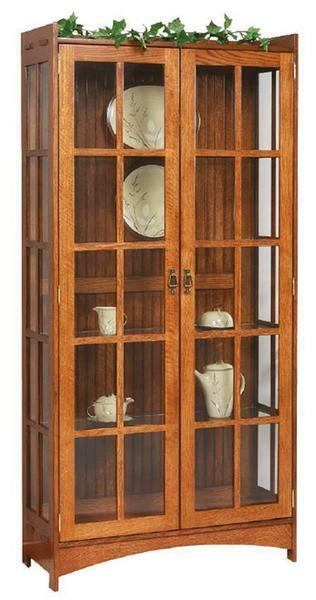 This mission curio cabinet offers a simple elegance for your living room or dining room. This spacious curio cabinet provides room for your trophies, precious wedding keepsakes and fragile music box collection. Bring beloved items out of the closet and onto the shelves of this mission curio. The stories attached to the items are waiting to be shared. In the ever popular mission style, this solid wood curio keeps it simple with little decoration, allowing the design of the cabinet and the solid wood selection to shine. The function and durability of this mission style cabinet make it a treasured heirloom itself! Take a look at our collection of Amish Curio Display Case Cabinets to find the style you like best. Enjoy our blog post, Curio Cabinet of Curiosities to learn about different curio cabinets and their features. Customize your mission curio cabinet with the wood and stain of your choice. Consider adding up to two additional shelves for more space. Call us today with any questions at 866-272-6773.